Peeters, 31 October, 2000. Mass Market Paperback. VeryGood. . "Minor shelf wear, ""
Peeters Publishers, 2001-08-01. Paperback. Good. Peeters Publishers. PAPERBACK. 9042909080 . New. 2001. Peeters Publishers, 2001-12-31. Paperback. Used:Good. 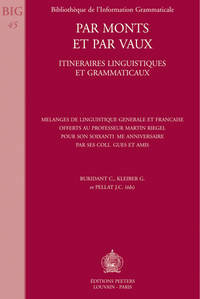 BURIDANT, C. / G. KLEIBER / J. C. PELLAT, EDS. LEUVEN: PEETERS, 2001. Encuadernacion original. NUEVO / NEW. BURIDANT, C. / G. KLEIBER / J. C. PELLAT, EDS. PAR MONTS ET PAR VAUX: ITINERAIRES LINGUISTIQUES ET GRAMMATICAUX. 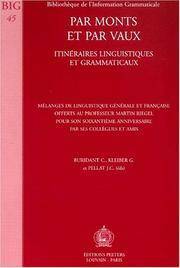 MELANGES DE LINGUISTIQUE GENERALE ET FRANÇAISE OFFERTS. LEUVEN, 2001, xv 455 p. Encuadernacion original. Nuevo. Peeters Publishers, 2001. New. Printed Pages: XVI-456 p.
2001-12-31. Good. Ships with Tracking Number! INTERNATIONAL WORLDWIDE Shipping available. May not contain Access Codes or Supplements. May be ex-library. Shipping & Handling by region. Buy with confidence, excellent customer service!